Oriflame has unveiled a new treatment which is clinically proven to target and fight under-eye dark circles with dramatic results. Inspired by aesthetic medicine, the Circulation Eye Power Accelerator Day/Night captures the best of advanced science to reduce dark shadows and alleviate symptoms of fatigue under the eyes – leaving eyes fresher and younger-looking. If blood vessels around the eyes weaken, blood pigments can spread and form dark circles. Bioclinic Circulation Accelerator uses Micro-Bright™ technology with haloxyl to fade this pigmentation and illuminate skin. In addition, extract of centella plant improves microcirculation and helps prevent further dark circles. 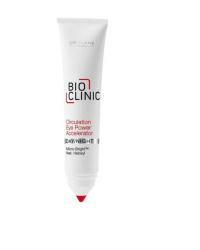 In clinical trials the Bioclinic Circulation Accelerator showed significant efficacy, reducing dark circles in just eight weeks and alleviating signs of fatigue around the eyes. The concentrated eye cream is part of Oriflame‘s first cosmeceutical range, Bioclinic, which is its most advanced performing skin care solution to date and aims to free the skin from everyday common complaints such as reduced elasticity or dilated capillaries. All Bioclinic products are developed by a team of leading scientists from Oriflame’s Bioclinic Expert Panel, specialising in skin biology and delivery. Inspired by aesthetic medicine, all the products contain specially designed technologies to target the skin’s own bio-defence mechanisms so that skin condition is improved. Oriflame’s Circulation Eye Power Accelerator Day/Night will be available to buy in the UK from 16 March onwards priced at £20.95, 15ml (a special launch price of £14.95 is available until 13 April 2013) visit www.orijen.co.uk to purchase or why not become one of Oriflame’s nationwide network of Consultants. To find out more visit www.orinet.co.uk.